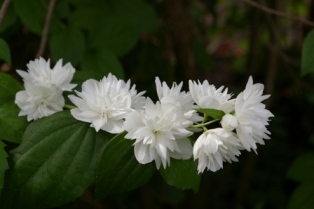 Joy Creek Photo Archive (c) all rights reserved Philadelphus virginalis x 'Minnesota Snowflake' becomes a large shrub with upright arching branches weighted down with double white sweetly scented flowers. Midsummer. 8 ft. x 8 ft.